A serviced apartment is a fully furnished apartment complete with a kitchen that comes with several services and amenities. When it comes to your temporary housing needs, a serviced apartment is a wonderful alternative to a hotel room or normal furnished apartment. 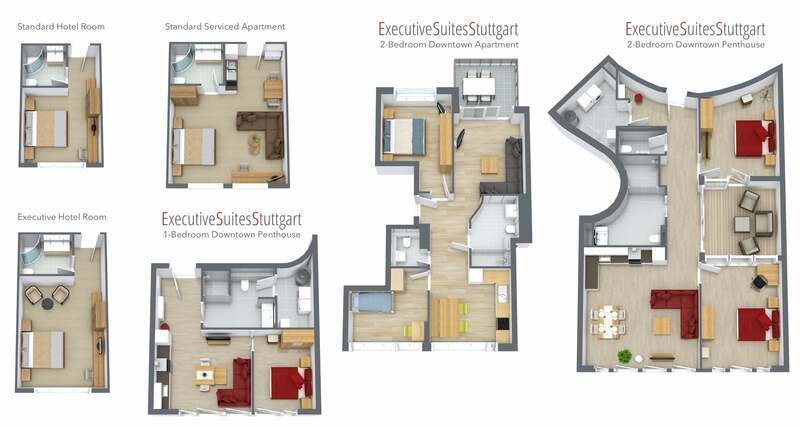 Whether you need corporate housing or are in the process of relocating to Stuttgart, we are confident that Executive Suites Stuttgart will provide a comfortable and convenient solution. How does a serviced apartment compare to a hotel room? The most noticeable difference between serviced apartments and hotel rooms is the size. Serviced apartments are easily two or three times the size of a hotel room. Our apartments and penthouses at Executive Suites Stuttgart are three or four times the size of normal hotel rooms or even hotel suites. More space means a much more comfortable experience: plenty of room to unpack your things without tripping over any of it, a separate living room and bedroom. Serviced apartments also provide more privacy. It can make a big difference to your sanity to be able to close the bedroom door. Plus with weekly cleaning service, you don’t have to worry about housekeeping showing up at random times. Moreover, if you’re in the process of moving to Stuttgart with kids, you’ll love being able to put them to bed at a suitable hour or let them play in their own room. And of course enjoy family time in the living room or kitchen. Speaking of kitchens, you can do real cooking in a serviced apartment. In most hotels your only option is to eat out, or you might be lucky enough to get a small kitchenette in a hotel suite or extended-stay hotel. That’s nothing like having a kitchen that is fully equipped with all major appliances and cooking necessities. These days we all rely heavily on the Internet in daily life. It can be very frustrating trying to deal with hotel wi-fi that is shared by hundreds of people, or expensive to pay for a premium connection. In a serviced apartment you get your own access to the Internet without paying more. These are just a few of the reasons you’ll want to stay in a serviced apartment for a long business trip or when you’re in the midst of a relocation to Stuttgart. How is a serviced apartment better than a normal furnished apartment? Serviced apartments are offered by companies that deal regularly with people who are new to the area. When looking for a furnished apartment on your own, you have to go through lots of individual landlords, most of whom only speak German and want to make long-term contracts. In regular furnished apartments, it’s up to you to keep things clean. In a serviced apartment, you can forget about deep cleaning thanks to the regular maid service. With towel and linen change, your laundry burden is reduced as well. Serviced apartments also offer the convenience of all utilities being included in a flat rate. You don’t have to worry about the specifics of your hot water use or figuring out utility bills in German. What makes Executive Suites Stuttgart stand out? Our apartments are large and are finely furnished with both comfort and style in mind. We don’t expect you to be satisfied with a studio apartment. We have a range of apartments with 1, 2, or 3 bedrooms. Our kitchens are equipped with modern appliances and all the cooking tools you would want to make delicious meals. We even provide storage containers for leftovers. Cook your own meals the way you like them! We provide you with your own private washer and dryer. Our maid service comes every week, and we always give you advance warning about when they’re coming. This is a far more thorough cleaning than the ten minutes you’d get in a hotel. Plus nearly all of our cleaners speak English! We give you a parking spot for each apartment, saving you the expense of a hotel garage or the hassle of looking for street parking in the city. When you stay in our main buildings downtown, we give you a free membership to the most exclusive gym in Stuttgart. Our flat-screen TVs give you cable with channels in English. We encourage you to call your business partners and loved ones internationally. All calls to landlines in Western Europe and calls to both landlines and cell phones in the USA are included. We provide you with your own private WiFi network with high-speed Internet. We offer TLA, TQSA, and TDY rates. We fill out your VAT forms for you. In addition, we offer flexibility when it comes to moving out. We know how unpredictable looking for housing is when you relocate to Stuttgart. How can you know exactly when you will find the perfect home? Most of all, we pride ourselves on personal service. Unlike extended-stay hotels with busy receptions or apartments with distant, unresponsive landlords, we are always on call. We are happy to help you with any questions or provide whatever you need. The only thing more impressive than the apartment itself was the service provided by the ESS staff. During the course of my career I have lived in numerous locations throughout the United States, Asia, and the Middle East and I have never dealt with a more professional and accommodating property management company. For more general information, photos & locations of our apartments and FAQ, please visit our Homepage.